Raising (& Teaching) Little Saints, Truly Rich Mom, and Arma Dei: Equipping Catholic Families. We share different ways, tips, stories, an real-life experiences that will help us focus on Lenten sacrifices, prayer and good deeds, and how to carry them out with LOVE instead of a GRUMBLE. Please scroll to the end of the post to see the list of link-up entries." Our HGU session this week fell on Pancake Tuesday. I handed the children their Kinderofper (Children’s Offering) bags. For Lent, the children are to donate some money that they’ve earned (for instance, by doing small chores for their parents) or pocket money that they’ve saved, for helping the poor. It is true that you don’t really learn something until you have to teach it. I thought it was the perfect opportunity to talk with the kids about what Lent is all about, why the 40 days, why we give something up. Then I realized that I didn’t actually know. I had some vague idea that parts of it had to do with sharing in Jesus’ suffering, but couldn’t coherently explain these whys. My ignorance astounds me. It is the blind leading the blind. Anyway, thank goodness for answers that can be found on the Internet. Frivolity and attempts to elicit chuckles from my readers aside, my Lenten season is about repenting for my errant ways, and cleaving ever closer to Him in love. Jesus Himself reminded me that Repentance allows for a closer and deeper love. A few weeks ago, during our holiday in India, we planned a day trip to Old Goa to visit its famous churches. On the bus ride over, a self-congratulating thought drifted into my head. “When I think of the Sorrowful Mysteries, I now only see Love.” Oh, how evolved I now am, how far I’ve come in the last while, I thought, mentally patting myself on the back. It was as if Jesus heard me, and set about to correct me, reminding me Himself that Repentance was the other side of the coin. Less than half an hour after I entertained this thought, as we exited the chapel housing St. Francis Xavier’s relics in the Cathedral of Bom Jesus, I was confronted with the most painful depiction of the Crucifixion I have ever seen. A life-sized figure of Christ is hung on the Cross, dying. He is raw red bleeding flesh, with only a few thin strips of skin that have not been torn away by the scourging. Ross left to find the others in our group. I leaned against a pillar, suddenly weak at the knees with remorse. In shame, I wanted to turn away from this sight, and yet I could not tear my eyes away. What monstrosities did we do when Pure Love chose to manifest Himself as one of us. How, in our sins and in our pride, we inflicted such suffering upon Him, and how He loved us so fully nonetheless. If this is what we are capable of doing with our Free Will, I wanted none of it. It felt wrong to take a picture. The searing memory of this scene in my mind’s eye is more than enough a reminder. Ross found the rest of our group and we moved on. I said nothing to the others about this experience*. In reflecting upon this Lenten season, I come to realize that Free Will is a two-edged sword. With it, mankind caused Jesus’ suffering. And yet, it is also that which gives our love for Him, our return to Him, its meaning and value. For so long, I have had my back turned to God. In the next weeks, of my own Free Will, I consciously turn away from the distractions of the world, set my heart towards Him, and follow His steps on the Way home that He so lovingly cleared for all of us. *This experience is one of many I've had this past year that convince me that God is a Personal God who intervenes in our daily lives, who knows our thoughts and our hearts, and who hears and answers our prayers! 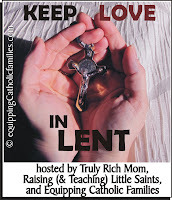 Check out the Lent reflections participating in the Keep LOVE in LENT Blog Link-Up 2013! 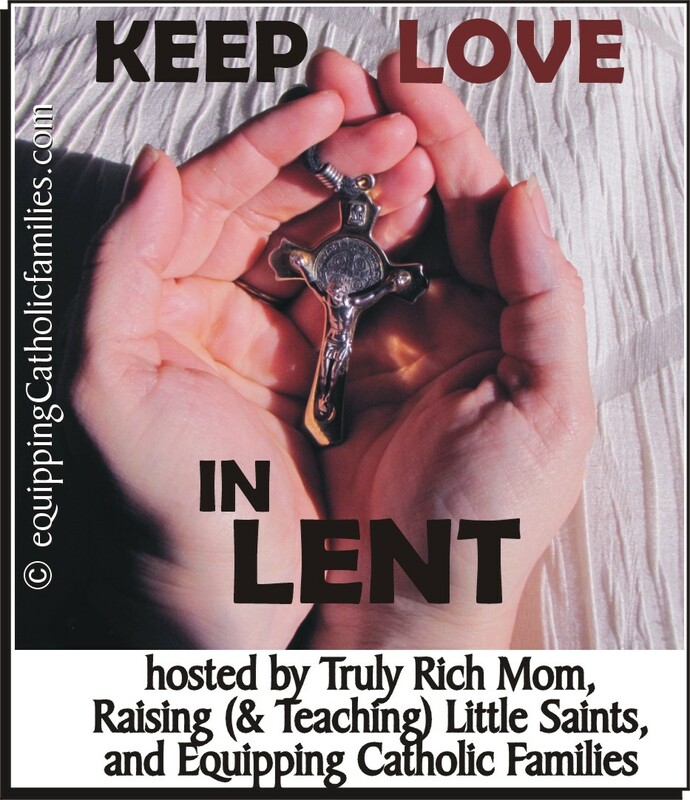 We'll be sharing different ways, tips, stories, and real-life experiences that will help us focus on Lenten sacrifices, prayer and good deeps, and how to carry them out with LOVE instead of a GRUMBLE. This post also links to RAnn's Sunday Snippets. Thanks again for hosting, RAnn! ah.. a sigh of relief because your writing is intelligent, funny, honest, grounded in reality and in the Spirit. It's amazing how much you realize you don't know once you start educating your own children. There are some great books out there to help you understand the faith more. Have you read Rediscovering Catholicism yet? It lays out the basic tenets with good explanations. Hi Crystal, thanks for the recommendation. I'll look up "Rediscovering Catholicism" in April (once I allow myself back on amazon). There's a lot being said these days about amazon ruining the book market. However, for me in Switzerland, where it is difficult to get English books in bookshops, it is a God send! Wonderful reflection, and I, too, find Free Will to be quite a mystery... and, as you put it, a double-edged sword. Great Post...I too sometimes forget about the immense amount of pain and sacrifice Christ endured during the passion for us because it was done with so much love. The love of the offering is sometimes all you see, it's good to be reminded of the sacrifice that brought the love to the front, it reminds us to be humbled. Look forward to reading more posts! Hi Ultreya, my background is some similar to yours. I grew up Catholic but didn't understand my faith well a all. I thought I did but I really didn't. I'm still learning because our faith has a long beautiful and some not so beautiful, history. So much to learn. I go to daily mass often which has helped tremendously learn more about scripture, liturgy and the saints. I like your children's offering bags. We are doing the rice bowl through Catholic Relief Services as our almsgiving activity. How wonderful that you were able to see Catholic Churches in India! I once saw a crucifix with a very beaten and bloodied Jesus too. It was hard for me to look at it too! That's the one and only of that type of crucifix and its burned into my memory. I completely relate to the desire to not photograph it. You'll always remember it! You should post your other pictures of the churches you visited. May God bless you and draw you closer to His Son this Lenten Season! I lived in Germany for four years, so I know what your describing- the crucifixion depiction in the shrine. The chapels and Cathedrals of Europe hold nothing back in their statues compared to the cleaned up crucifixes in our American churches. I was often stunned by them. Thanks for sharing about that it gave a me memories that are nice to recall and reflect on. 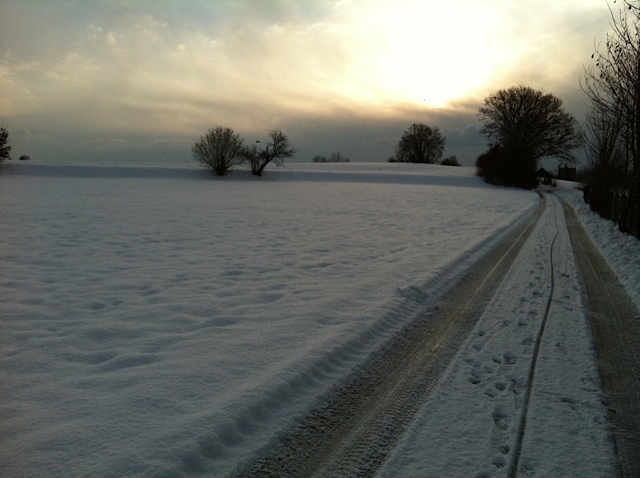 And I liked the way home photo because it gave me the feeling on your pilgrimage. Much Blessing to you this Lent! I am learning so much that I didn't know now that I'm a mom and have to teach them. Just think, at least our kids will be farther along than we (God willing). The picture you posted alone is a Lenten reflection. A long road with a light ahead. The picture you posted is a beautiful reflection in itself, and it fits your message perfectly. A long road with a light at the end. What a wonderful journey you are on. God is so good to use our children to make us learn things. I grew up much like you did, with no meaning behind my Catholicism. Once I had kids and started homeschooling, I was amazed at how much there is to learn. I was also amazed at how much they knew at their young ages that I was just learning. God is good! My own understanding of my Catholic faith did not really begin until I had my first child, even though I was a cradle Catholic. I wish I would have understood more as a child but am so grateful to have had the opportunity to learn alongside (and from) my children. Our faith is a journey of discovery and letting go no matter what age you embark on it, and what a journey it is. Very nice reflection. I hope that we all find Free Will as a tool to give our praise and thanks to the Lord. Thanks for sharing! Thanks for stopping by, Ginger, and good luck with your coming delivery! I could very well relate to you in your struggle to be patient with your children. That's one of my struggles, too. Being patient with my eldest son who is not as obedient as I hope he would be. And I struggle a lot not to raise my voice these days. "Slow to anger, abounding in kindness and relenting in punishment" is my battlecry this Lent. 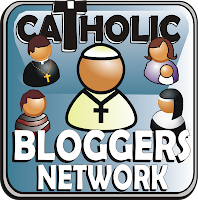 Wow, your blog is truly enlightening...I am just so happy that I found you thru the Lenten blog hop. The statement of free will as a double edged sword is so simple, yet deeply profound....thank you for this. I really needed it today. Thanks for stopping by, Chris. 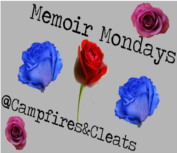 I hope to join your Memoir Mondays one of these days. Wow! That description of the dying Jesus stays in my mind. I once saw a statue made from the wounds on the Shroud of Turin and it was hard to look at, so I understand you feelings. It makes repentance real. Oh, I know how you feel. Being a catholic all my life, when having children, you truly get inspired to live your faith b/c they are watching us. I started to looking more into Fast and its benefits beside that offering up for Christ but even health benefits and so. You can check out on my blog (Pray and Fast) and also we have a group on Facebook call: Pray & Fast: a Challenge to transform yourself for Christ. God is so great in all the beauty HE gives us through His Holy Church! Have a Blessed Lent. I'm not sure if I have the right words to thank and congratulate you on this very fine reflective post! Your honesty and simplicity in writing and expressing your feelings made me live every word you wrote. I wish you a blessed lenten season. Your experience of the crucifixion statue reminded me of how Jesus works in our lives...even giving us little reminders when we need them. Thanks so much for sharing!